Head Coach Jimmy Johnson was the cornerstone of the Hurricane football program that personified the team on the 1980's. After taking over the helm of the team that had just won the University's first National Championship in 1983, Coach Johnson structured the football program from a fairytale underdog to a national powerhouse, dominating intercollegiate for years, rather than just a season. 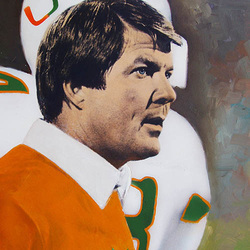 In his last three seasons Jimmy Johnson served as head coach, the Hurricanes finished in the top two (2) and captured the 1987 National Championship. During Coach Johnson's tenure, the Hurricanes set school records for consecutive wins, with 36, and consecutive road victories with 20. Jimmy began Miami's NCAA-record 58-game home winning streak by posting victories in his final 26 games in the Orange Bowl. He went on to coach the Dallas Cowboys to two Super Bowl victories in five years and coach the Miami Dolphins for four years. Coach Johnson is presently a football analyst for Fox and HBO.